The structure of cross-linked polymeric gels is very similar to soft tissue—which is one reason that understanding this material is so critical, according to Kelly Schultz, assistant professor in the Department of Chemical and Biomolecular Engineering at Lehigh University. Schultz was part of a special session of the American Institute of Chemical Engineering (AIChE) Annual Meeting in Pittsburgh last month, where she was invited to present her lab's work determining how increasing the concentrations of polymers in solution changes the structure of cross-linked gels. The title of the session was "AIChE Journal Futures: New Directions in Chemical Engineering Research." Schultz's talk was based on a paper she contributed by invitation to AIChE's inaugural "Futures Issues" designed to highlight the work of early career researchers. The paper, co-authored by her former Ph.D. student, Matthew Wehrman, and four Lehigh undergraduates, is called "Rheological properties and structure of step— and chain—growth gels concentrated above the overlap concentration." "Increasing the concentration of polymers enables them to interact," says Schultz. "These interactions can change the structure of the material and even potentially weaken it." 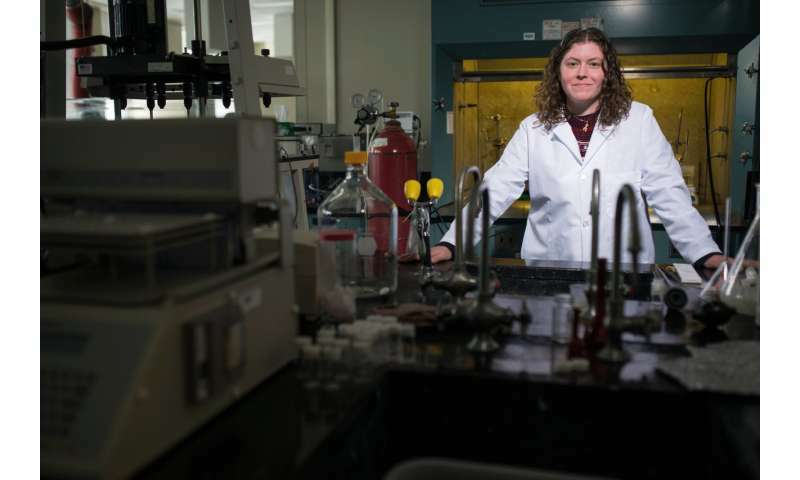 Through experiments, she and her team discovered that the structure of cross-linked polymeric gels is independent of concentration, until a limit is reached—called the overlap concentration— which is when the polymers begin to interact. After this limit, the structure is again independent of concentration. The group's central discovery is that more polymers does not necessarily mean the gel will be more elastic or stiffer. "This was unexpected," says Schultz. "We thought that there would be a gradual change in the scaffold structure but instead there is a step change when these interactions become high enough." Identifying this characteristic could be of particular importance for industrial applications as the team's work shows that these cross-linked polymeric gel structures can be achieved with a smaller amount of polymer. "In other words," says Schultz, "you can get the result you want with the least amount of material." Schultz's work on this is novel because of how her team looked at scaffolds at high polymer concentrations—or with polymeric interactions. Most studies, she says, stay under the overlap concentration so that polymer interactions do not complicate gelation. "With this work, chemical engineers may begin to understand how polymeric interactions change gel structure and how these structures can be accessed at relatively low polymer concentrations," says Schultz. The team used a technique called multiple particle tracking microrheology (MPT) to measure the gelation of these polymeric hydrogel scaffolds. This technique uses video microscopy to capture the thermal motion of embedded probe particles. From the thermal motion they can determine material properties. Using MPT in combination with an analysis technique, time-cure superposition, they were able to determine the gelation time and structure of the material at the gel point, which is when the first sample spanning network cluster forms.